Narcolepsy is a relatively rare sleep disorder, affecting an estimated 200,000 Americans. However, researchers believe many more people with this sometimes debilitating sleep disorder may be undiagnosed or misdiagnosed, due to this condition being difficult to recognize based on symptoms alone. Many other sleep disorders, physical illnesses, drug interaction side effects and even mental illnesses can present with some of the same symptoms as narcolepsy, such as excessive daytime sleepiness, muscle weakness, collapse, hallucinations and sleep paralysis. After evaluating your medical history and interpreting your MSLT sleep study test results, your sleep medicine physician can work with you to create a plan for managing your symptoms and getting your narcolepsy under better control. Narcolepsy is a chronic neurological disorder affecting both men and women. It tends to have its onset before the age of 25, though it can start at any point in life. Narcolepsy can arise for seemingly no reason, though in some circumstances, it can result from experiencing another illness, such as brain disease or trauma or an autoimmune disorder. The actual mechanism that causes narcolepsy is a lack of a neurotransmitter in the brain responsible for regulating your sleep-wake cycle. If you have narcolepsy, you’re sleepy all the time. You enter REM sleep almost immediately after drifting off to sleep or nap. Your brain may even think you’re asleep when you’re awake. It may subdue your muscle activity by making your arms, legs and torso weak enough to cause collapse, or trigger REM-state dreaming sessions that feel like waking hallucinations. With narcolepsy symptoms like these, you may feel as if there’s little boundary between your waking life and your sleeping life. If you experience some or all of these, you may fear you’re losing your mind or have a serious illness. Indeed, many people with narcolepsy go undiagnosed or receive an incorrect diagnosis somewhere along the way. One study estimates that up to 60% of patients are living under the wrong label, with depression, insomnia and obstructive sleep apnea being the most common diagnoses. According to The Narcolepsy Network, a mere 25% of people with this sleep disorder have been accurately diagnosed and are receiving treatment. That means many more individuals are struggling to stay awake and live productive and safe lives, all the while wondering precisely what’s wrong with them. Getting an accurate diagnosis of narcolepsy is critical—but how? If you have the above symptoms, step one is to consult a sleep medicine physician with AASM (American Academy of Sleep Medicine) accreditation. An AASM-certified sleep specialist is a medical doctor with additional training and expertise in sleep medicine. Your first visits with the sleep specialist will involve a physical exam and consultation to discuss your clinical history. The sleep specialist will ask you about your sleep habits, sleep hygiene, and your set of symptoms. You’ll need to supply a full medical history, including any family history of sleep disorders or excessive daytime sleepiness. If you’ve been to a sleep lab before, or have been diagnosed with any conditions that may impact your sleep, be prepared to share this information or even medical records. The doctor will likely ask you to keep a sleep journal for 1-2 weeks in order to track your sleep and symptoms. To confirm your diagnosis, the sleep specialist will request that you undergo an overnight polysomnogram (PSG) sleep study and a daytime multiple sleep latency test (MSLT). Together, these tests can rule out other sleep disorders and point to a diagnosis of narcolepsy. The PSG will monitor and record your brain waves, heartbeat, blood oxygenation, pulse, eye movements, muscle tone, and other aspects of sleep. Technologists will also observe you to see if you experience any snoring or movement during sleep (such as tossing and turning, sleepwalking, sleep talking, or periodic limb movements). A PSG will show the sleep techs and your doctor whether you have sleep apnea or other sleep disorders that may be responsible for your chronic sleepiness during the day. If you have narcolepsy symptoms, you’ll likely undergo a MSLT test the day after your evening sleep study. The MSLT is a test that measures the quality of your naps and how long it takes you to fall asleep when napping—and what that daytime sleep looks like. Many people have daytime sleepiness. However, subjectively, they may believe that they nap more frequently than they actually do, or that they fall asleep faster than is actually the case. To get a true understanding of your daytime sleepiness and whether you enter REM sleep during naps, sleep specialists need an objective, neutral measure of how long it takes you to fall asleep in the daytime and what that sleep looks like. 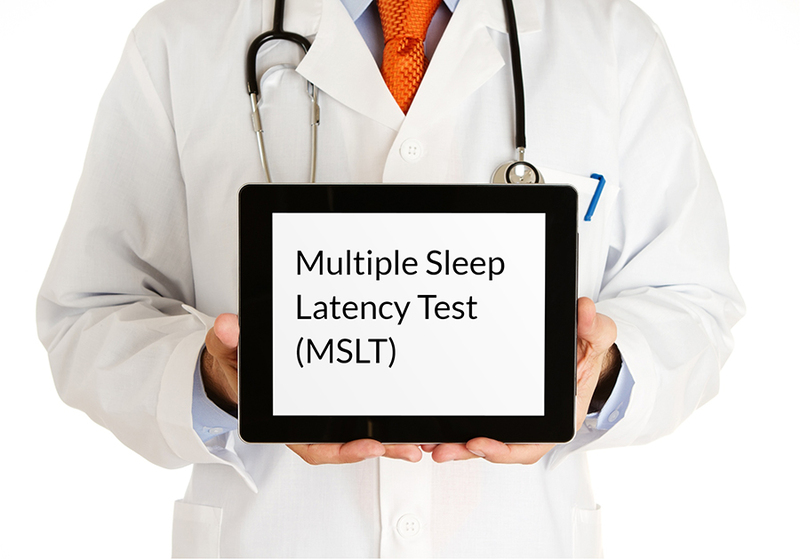 The multiple sleep latency test (MSLT) is the diagnostic tool that provides that data. You will be scheduled for a multiple sleep latency test the day following an overnight sleep study, in order to get as much data as possible before making a diagnosis. Individuals need to be tested during four or five 20-minute nap periods, with two hours of awake time in between each period. The exam consists of lab technologists letting you nap in the dark for 20 minutes, then waking you up for a period of two hours. They then repeat this process several more times. The exam takes about 7 hours, or an entire day. What is the MSLT, exactly? What does it measure? The MSLT is a test that measures daytime sleepiness and its effects; specifically, how much time elapses from the start of a nap session until you begin to fall asleep. The purpose of the test is to gauge how consistently you fall asleep when the conditions are right for napping (when the room is dark, quiet and cool). During the MSLT, you’ll be hooked up to electrodes and sensors on your head, chest, eyes, and chin, much as you were during the overnight sleep study. Sleep lab technologists will record your brain activity, muscle activity, and eye movements when awake and asleep. Specifically, they’ll be looking at “sleep latency” or “sleep onset latency”—the amount of time that passes between when you’re fully awake (but sleepy) to when you enter the first stage of sleep. The test will also help them to see how quickly you enter and exit REM sleep. Your MSLT sleep study results are then evaluated alongside your PSG results to determine whether you have a different sleep disorder that’s affecting your daytime sleepiness or if you are more likely to have narcolepsy. You fall asleep in less than 15 minutes during your overnight sleep study. You fall asleep in less than 8 minutes average during your daytime naps, according to the MSLT. Once your sleep medicine physician has these results in hand, they can work with you to design a treatment plan to manage your symptoms. If you think you might be suffering form Narcolepsy and live in the Kansas City, Kansas region, please contact us at Sweet Sleep Studio today at (913) 221-6059.